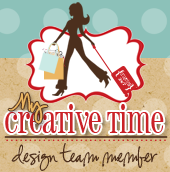 Welcome to another 3D Wednesday at My Creative Time!! We are having some crazy weather here in California! First it's raining and then its over 90 degrees! So while I'm adjusting to this weather, I am playing with all of My Creative Time stamps! Mother's day is around the corner and I wanted to share this frame I altered using My Creative Time Dies and Stamps. This would make a cute gift for any mother. I picked up the wooden frame from Walmart for a dollar. I then primed it with Gesso and rubbed pick and blue paint around the edges. I used my scraps of paper left from the Echo Park Collection "This and That". It was very simple..I just ripped the papers and then distressed them using TH Distress ink. I adhered them using the Glue and Seal from Inkssentials. Did you see the textured flowers? After I cut my flowers out using the Flower Petal Die (my favorite die!! ), I used the negative as a stencil and painted it with Snow Tex and a little bit of craft paint. After the frame dried, I added more paint by rubbing it in with my fingers. I think it came out cute. The sentiment is from the My Favorite Sayings set..I thought this went perfect with the photo of me and my daughter..What do you think? Don't forget to link up your project for todays 3D Wednesday! And please visit the Design team for more creative ideas! Big crafty Hugs! Nancy ~ Oh my goodness! Does your creativity and talent EVER end! First painting the frame ~ it turned out GORGEOUS! You added the flowers just PERFECT ( in the right spots and LOVE that paper) But best of all about your project is the picture! What A GREAT picture and cherished memory! LoVe it!!!! Fabulous, Nancy! Great project but what a sweet photo too! Love! nancy, your frame is stunning! Your frame turned out beautiful! So clever to use the cut as a stencil...it worked perfectly! Great job! Wow! Your frame is just so beautiful and creative! I love the colors and just everything about it! Great job, Im sure your mother will love it!! What a pretty picture of you and your little one! Wow! Beautiful job on altering this frame! It looks perfect! The flowers are just the right touch too! Great job!